I have simply installed cPanel 11.50 on Amazon VPS CentOS 7 Server recently and after that i found my website not propagating online because of apache was not working and check below error on server through below command on Centos 7 . Sep 24 08:24:20 cpanel.techtransit.org systemd: Failed to start Apache webserver managed by cPanel EasyApache. Sep 24 08:24:20 cpanel.techtransit.org systemd: Unit httpd.service entered failed state. I checked about error but my module was showing properly and not really see any syntax error there. After I rebuild apache via EasyApache in cPanel and It worked perfectly and Now apache running properly. 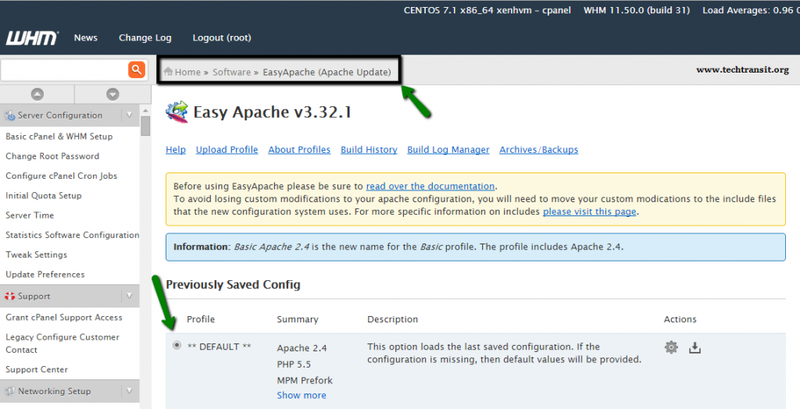 You can check below image or follow point for Rebuild apache in cpanel. (2) In the Find box type Easy and Click on EasyApache or You can find like below . (3) Click on Next Step and select and choose customezed based profile . (4) In next step select apache version you wish to build and Now click on Next steps. (5) Select PHP Version . (6) On the next screen, You can select default module which is most of the use or you can select Exahustive Option List , if any module not in the list and Now click on Save and build button. 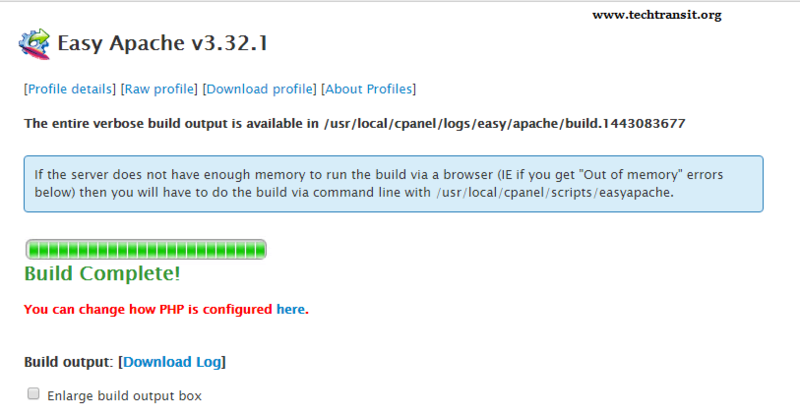 It will take time to finish build .After that you check apache running status.